USP <797> provides practice and quality standards for all persons who make Compounded Sterile Preparations (CSP) drugs and nutrients and for all environments in which they are prepared. USP <797> requires that the preparation of CSPs occur in ISO Class 5 (Class 100) environments, buffer areas of ISO Class 7 (Class 10,000), and ante-areas of ISO Class 8 (Class 100,000). Achieving and maintaining USP <797> compliance in sterile compounding cleanroom environments requires the practice of special cleaning procedures and protocols. Click here to open our Quick Reference Guide on USP <797> cleaning compliance and click here to open our USP <797> Products Guide. 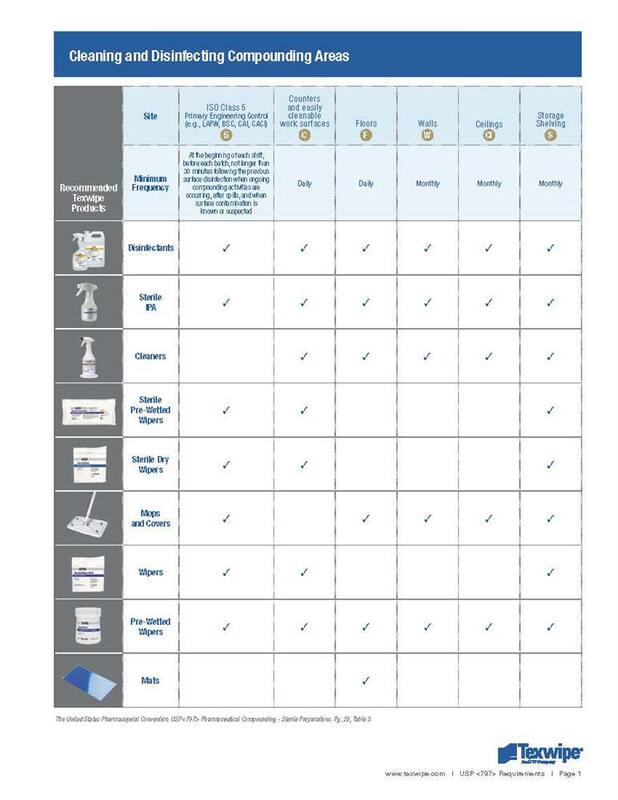 Texwipe offers a comprehensive array of cleanroom consumables including Sterile IPA, Sterile Dry and Pre-Wet Wipers, Autoclavable Mops, Disinfectants and Cleaning Validation swabs that are designed to make USP <797> compliance easier for you.